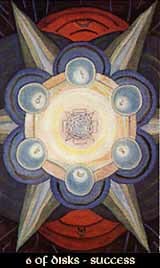 With the Six of Disks the Suit enters the harmonious realm of Tiphareth, back to the well-balanced middle of the Tree, leaving behind the crisis of the Five, regaining success and wealth. Having experienced both the bad and good sides, gain and loss, the Six of Disks has achieved a wiser attitude towards material concerns. Nothing is taken for granted so easily anymore, and losses won't be taken for the end of the world. The material wealth is viewed in its actual value, not higher than it is, and not lower when we actually had expected more.